IHMN Society of Thule & some more Steam Tanks. This weekend I finished up the first batch of the Society of Thule Company for In Her Majesty's Name, as well as 2 more Steam Tanks from Ironclad Miniatures. As I have come to expect, these are beautiful miniatures, and each has lots of character. I need to do a little touching up of the bases, but that will be an ongoing issue & isn't that big a deal. I've also completed the last 2 of the Steam Tanks I purchased from Ironclad Miniatures. 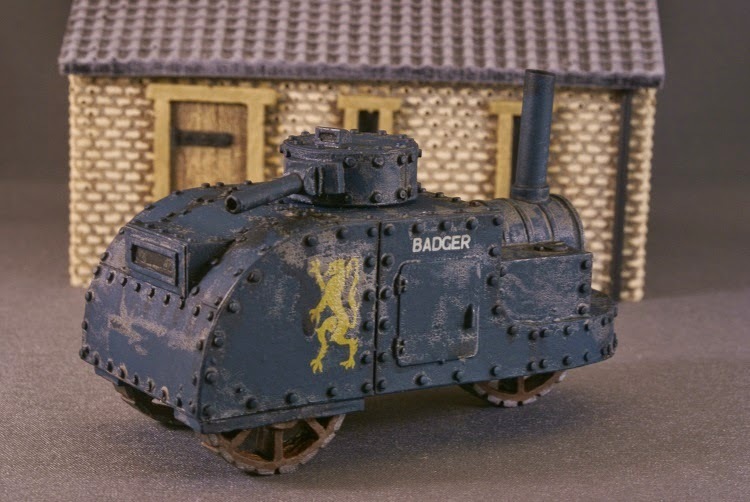 I have decided to theme each tank towards a faction for IHMN, however they can of course be used in various other games such as Pulp Alley, G.A.S.L.I.G.H.T etc. I've armed both with an MG. 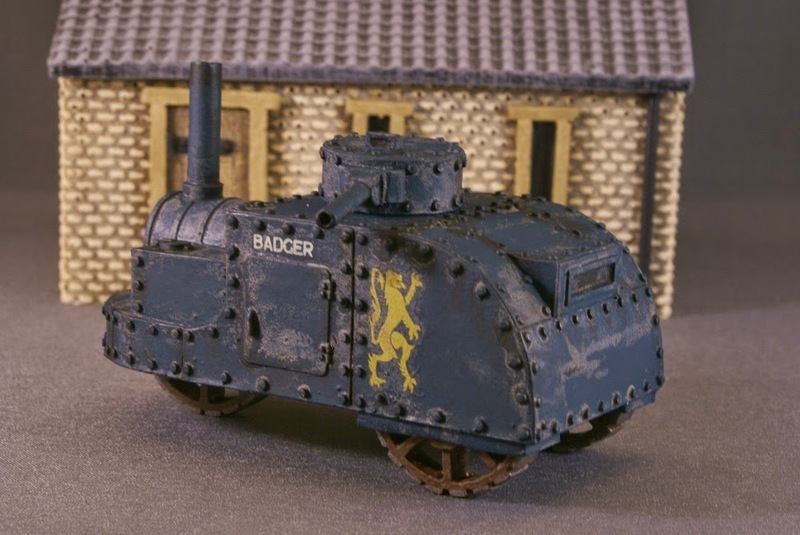 This second is the same model that I used for the Badger, however I added the wheel sponsons on the outer hull. This Tank I've decided to paint up for the Servants of Ra Company. MAYDAY is this Saturday, so the rest of the week may see a little more painting, however I will also be digging around looking for items to place into the Auction. Another good long weekend which has allowed me to spend some more time at the paint table. These first 2 are both metal Old Glory. The fella with the blunderbuss had his foot snap off, so I made him another Peg-leg. Seems I am painting a lot of peg-legs lately. These next 3 are also all metal. I am not sure whom the left figure is from. I believe the middle figure is Black Scorpion (though I could be wrong). The fella with the long rifle is Foundry. 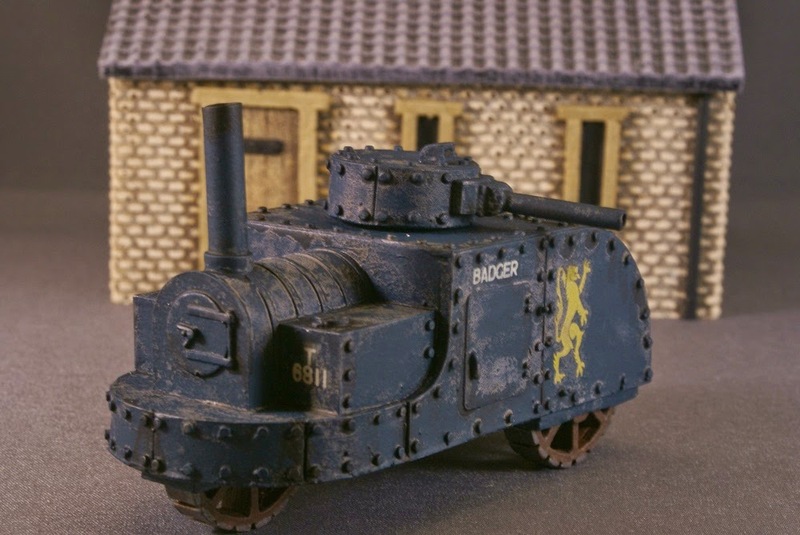 I am now working on finishing off a 2nd steam tank. As well the Society of Thule are still making progress. I may get some more painting done later this aft, once I get my tires switched. As well, tomorrow night is EDBAG, where we continue the Kingmaker Campaign. We Need a Stinkin Badger! I finished off a Steam Tank which will eventually join the Scotland Yard Company in various rule sets I plan to use them in down the road. This resin with some metal part kit came from a company called Ironclad Miniatures who had quite a range of model kits. I will admit I was mildly surprised when once again the Midnight Blue reacted in an odd way with both the Army Painter Dark Dip & then the Matte Spray. However in this case I was quite happy with the effect. It actually makes the model appear weathered in what I feel is a very positive way. Definitely not a planned event, but I will take certainly take it! The decals used were from my huge selection of old Tamiya & other plastic model kits, as well as the Rampant Gryphons from GW. Tomorrow night is club night at EWG. As well I have another steam tank started, the Society of Thule have begun to feel the brush & of course the continuation on my Pirates. We began our new DBA themed campaign last night at EDBAG. This time around Dennis proposed playing Kingmaker & fighting the battles using DBA. We had 4 players to start. Year 3: Hastings marches onto Berkeley & offers to let him depart peacefully if he should slay Edward of March. He does. Year 4: Bourchier sails to Calais & after being given access, kills Richard of Calais. A Lancastrian King is crowned, now there are 2. Year 5: Our one & only battle of the evening which carried. Stafford (me) attempts to do battle to capture a king at the Battle of Barnet. The forces are equal strength. Alas a string of many 1's cause my army to falter. To add salt to the wound Stafford is slain. All in all a deplorable night for me. My forces lacked strength enough to capture an heir on my own. When I did have an opportunity, my dice failed me miserably. I think I shan't be too much a thorn for the next round. A very productive weekend has seen the completion of the Scotland Yard Company for IHMN. First up is 'The Consulting Detective' & the 'Good Doctor', guess copyright prevented going any further. Next up are the Sergeant & one of the members of the Special Branch w/carbine. I admit that I was generally trying to follow the esteemed Kevin Dallimore's paint pallete which certainly does take away some of the guesswork of what would look best. And here are the other 2 Special Branch w/carbine figures. I must say I am quite happy with these Northstar Miniatures. Their poses are dynamic & they are well sculpted with wonderful details. I have got the Society of Thule Company based & will be starting on them next. Last night at the club I got into Bob's game of C&C Ancients, Epic edition, meaning a large scale battle with several generals led by 1 commander per side. This battle pitted a force of Gauls, facing the Romans. First battle I was playing the left Gaul force opposite Bruce. Below is my first move. Bruce mauled my forces, forcing my auxilia on the hill to withdraw. Things were not looking good. Meanwhile things were continuing to develop in the centre. I eventually got my general with the medium horse into the fray & was able to return the favor, eventually slaying Bruce's general in the mix. The game went quite quickly, so we switched sides to play again. This time I played the Romans on the opposite flank, again opposite Bruce. The dice were no friend to Bruce as his chariot hurtled forward into some of my light troops, inflicting minimal damage. Lady luck saw the death of his general yet again with the death of several of his units. For as many players as we had ( 6 in this bout) the game was fast & Dave mentioned that the overall General can feel a bit overwhelmed trying to deal with commands to the flanks while still focussing on his own field. More images can be seen on Bob's blog.